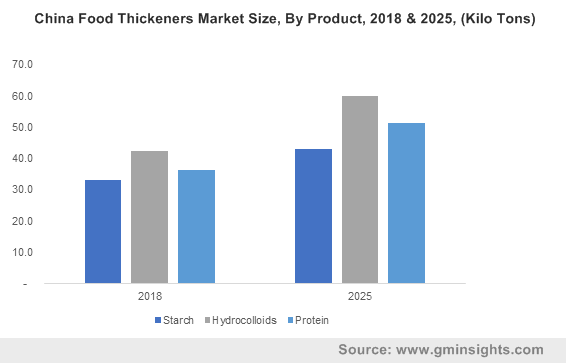 Food Thickeners Market size was over USD 8.4 billion in 2018 and industry expects consumption of above 1 million tons by 2025. Shifting consumer preferences towards healthier diet and enhanced organoleptic characteristics should increase food thickeners market size. Rising need for convenience nutrition products has increased thickeners utilisation owing to its beneficial characteristics including ingredient emulsification and palatability, thus accelerating industry growth. Thickening agents alters viscosity in dietary preparations which in turn benefits dysphagia patients with utilitarian characteristics including bolus control, pulmonary aspiration and ease of swallowing, thus driving the global market growth. These products have relatively low price, optimum functionality, easy availability and abundant supply. Mounting organic products demand to prevent diseases including diabetes, obesity and blood pressure along with high contamination issues in conventional dietary goods is likely to fuel the market by 2025. These products are predominantly utilised in bakery applications owing to its foaming and gelling property which provide cake & pastry batters with high-shear mixing, pH conditions, lower baking time & temperature along with extended shelf life. Rise in number of specialised stores for bakery products supported by growth in home baking trends will have positive impact on the global market. Stringent regulations by FDA and EFSA regarding permitted levels of thickener in dietary products may lead to higher compliance cost which will limit industry profitability, thereby affecting food thickeners market price trends. Excessive usage of thickening agents including xanthan gum and carrageenan may lead to adverse health anomalies including nausea, flatulence and bloating, which may restrict industry growth. Protein food thickener market size is estimated to reach USD 4 billion by 2025. Protein thickeners are widely employed in bakery industry for icing of cakes and pastries. It is also used as a foaming agent due to its high foaming characteristics. Gluten in bakery products has numerous side effects including diarrhea, abdominal pain and headaches due to which it being replaced by safer food additives including thickeners, thereby driving product demand in forecast timeframe. Starch food thickeners market size is projected witness gains of over 4.5% by 2025. Owing to stability and gelling properties these products are predominantly utilised in fast foods including noodles, potato chips, soups and hot dog sausages. Growing fast food chains due to rapid development of hotel industry and quick serve restaurants will favour thickeners market size. Plant based food thickeners is projected to witness gains of over 5% by 2025. These products offer fat free and low calorie as compared to other alternatives including microbial and animal-based thickeners. Growing consumer preferences towards low calorie dietary intake should accelerate plant-based thickeners product demand due to its beneficial health attributes including lowering cholesterol level and preventing heart diseases. Microbial based food thickeners market size is estimated to reach USD 5.5 billion by 2025. It is used as gelling-agent, low calorie spreads, coating agent and texturizer. Wide utilisation in confectionary manufacturing due to reduced gelling time will stimulate product demand. Beverages application segment may surpass USD 2 billion by 2025. These products are widely used in fruit pulps, juices, and energy drinks, owing to their feature of providing desired viscosity without deteriorating nutritional value. Adoption in healthy lifestyle of consumers has led to upsurge in demand for nutritional beverages, which in turn will drive global market size by 2025. Sauces & dressing application segment is anticipated to exceed 230 kilo tons by 2025. Agar agar, xanthan and arab gum are largely utilized in manufacturing of sauces and dressings. These thickeners provide beneficial attributes including high emulsification, stabilizing and hot & cold cooking application properties. Asia Pacific led by China, Japan and India market projected to witness gains of over 5.5% by 2025. Increasing food & beverage demand due to growth of supermarket & e-commerce sectors with rising consumer awareness & easy product accessibility is anticipated to fuel product demand. Rising utilization of thickeners in dietary products for product texture enhancement and prolonged shelf life should stimulate industry size. Europe driven by UK, Italy, France, and Germany food thickeners market is estimated to reach up to USD 2.5 billion by 2025. Significant rise in obesity among European population has led manufacturers produce replacement of fat containing ingredients. Increasing demand for plant & microbial based thickeners due to low calorie characteristics should perpetuate industry growth. Brazil market size may witness growth in forecasted timeframe owing to growing exports of meat products. Thickening agent is utilized in improving texture, increase juiciness and toughness reduction, thereby driving product demand. 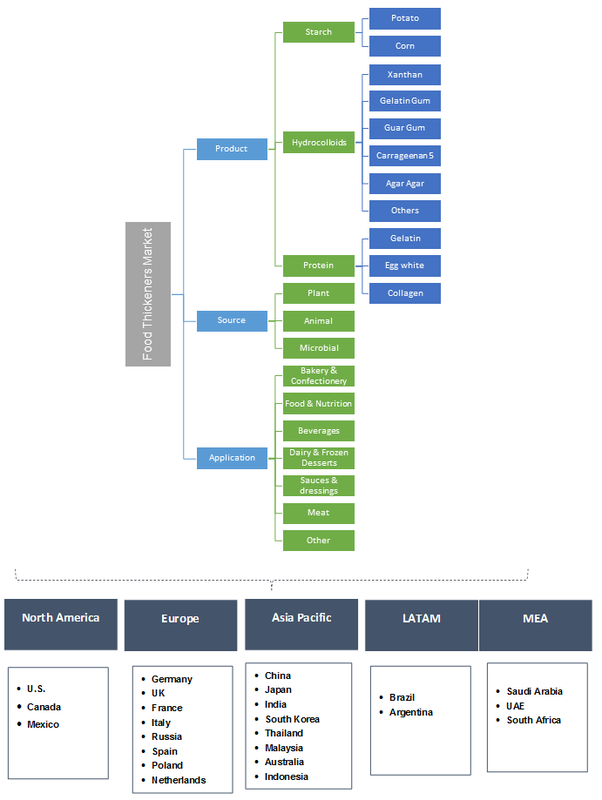 Global food thickeners market share is moderately fragmented with major manufacturers include Cargill, Ashland Specialty Ingredients ADM Company, Ingredion, C P Kelko, Edesang, Fooding Group DowDuPont, and Jungbunzlauer. Dietary products manufacturers are engaged into product improvement and refining physical appearance including taste, consistency and stability. Manufacturers are involved in collaboration and partnerships with different research institutes and local manufacturers to develop new products and cater rising global demand. Food thickening agents are generally a group of polysaccharides or proteins which structure in a linear way to form thickening agents which includes starch, hydrocolloids and proteins. These thickeners increase stability and consistency of dietary products when it meets water, improves water retention levels is also processed without changing its other properties including texture and taste. They are used bakery products, confectionery, sauces, dressings, pickles and gravies, beverages, dairy and frozen desserts, prepared and processed meals. Changing dietary preferences supported by high investments in offering variety products will favour industry growth.